You are a cuckservative. But I say this with the utmost respect and affection, so please read on. Recently, you have been opining about the Alt Right and the legitimacy of the NeverTrumpers. Specifically, you recommend that conservatives “John Birch the Alt-Right,” referring to how your former boss Bill Buckley slipped a stiletto between the ribs of the John Birch Society over 50 years ago and effectively ousted them from the mainstream. Furthermore, you continue to withhold your endorsement of Donald Trump and argue with your critics about the philosophical meaning of patriotism, conservatism, and the like. This all makes for some great reading, of course, but I believe your positions on the Alt Right and Donald Trump amount to little more than stodgy bunkum. This, in my opinion, makes you just a wee bit dangerous to the future of this country, if we want to maintain our first-world standards of life, that is. Now, I know what you’re thinking. “Who the hell is this guy and why does he presume to know more about politics than I do?” I can understand that. You’ve been writing for National Review since the 1990s, and I burst on the scene way back in March of 2016. You have the benefit of decades of study and close contact with some of the best conservative minds of the last and current centuries. Meanwhile, I’ve read a few books in my spare time. You’ve appeared on national television and debated world-famous personalities, whereas I’ve appeared only before my monitor and debated nothing more than my conscience. But instead of viewing me as some ignorant upstart challenging one of the giants of political punditry, please view me rather as a savvy, number-crunching baseball fan who takes issue with a PhD dissertation on the statistics of baseball. Every once and a while the woodwork produces some good stuff. Anyway, my issue with you stems from the fact that Leftists have won the day in our culture wars and that you are the exactly the kind of conservative these people permit in our mainstream society. Trump and the Alt Right are not permitted, of course (albeit for mostly different reasons), and this is essentially why you have joined your colleagues on the Left in standing against them. Yes, they are your colleagues despite your deep and profound philosophical differences with them. I say this because if they were truly displeased with you, you’d be out of a job. I’m sure your ex-colleague John Derbyshire can tell you more about it if you’re interested. Only, you really aren’t sticking it to us. You are accurately describing us, as if this description alone were enough to convince reasonable conservatives to pick up their torches and pitchforks and chase us out of town. After this, you admonish some conservatives like Hugh Hewitt for ignoring or downplaying the racial aspect of the Alt Right, and then conclude that the Alt Right has to go. Do you not see the critical gap in your thinking here? You fail to ascertain whether there is any truth or justice in the Alt Right’s racialism to begin with. You don’t even go there. You just assume that there isn’t just like your colleagues on the Left. Imagine a 17th-century cardinal or similar Catholic muckamuck condemning Galileo’s work on astronomy as blasphemous without actually doing the research required to prove Galileo wrong. Sure, the cardinal would be correct in his assessment of Galileo, just like you are correct in describing the Alt Right as racialist, but that doesn’t mean the people being condemned are wrong, either morally or factually. One does not have to “live and breathe politics and political philosophy” like you do to see this. In order to break the Alt Right, you would have to demonstrate that the biological notion of race is irrelevant or trivial with regard to human affairs. In order to do this, you must prove that there is no significant genetic correlation between race and human attributes such as strength, intelligence, wisdom, dexterity, et cetera. Can do this, Dr. Goldberg? Are you qualified? Where did you get your Ph.D. in genetics from, doctor? Sorry to have to resort to sarcasm, but it is always frustrating when well-established scholars like yourself believe that expertise in one field can willy-nilly be brought to bear in another. William Shockley understood this, which is why he traded notes with Arthur Jensen and brought psychometric data to the table rather than transistor radios whenever discussing race, eugenics, and IQ. It is not too much to ask that you do the same. Furthermore, I am quite sure that if you do attempt to bring data to the table you will quickly realize that your opponents on the Alt Right will have more of it and will have thought more about it than you have. True, no one has (yet) compiled conclusive genetic evidence demonstrating that certain races are intellectually or morally superior to others. But data does exist. For example, in 2013, St. Louis University researchers discovered that, from a sample size of 2,500, 5% of black men and only 0.1% of white men had two or fewer copies of a gene called MAO-A. Why is this a big deal? Because MAO-A helps control impulsive behavior and aggression. A person with three or more copies of this gene is considered normal. Fewer than that, and you are much more likely to live a life of crime, like a highly disproportionate number of black men do. Of course, the human genome is unfathomably complicated, with many more than just one set of genes controlling traits. The example above is not conclusive evidence of racial differences. However, it points to the fact that there is more genetic evidence supporting the race-realist perspective than not. Think about it like this. So what if we don’t yet have conclusive scientific evidence for racial differences? We also don’t yet have conclusive scientific evidence of intelligent life on other planets. Does that mean there isn’t intelligent life on other planets? I think we would both agree that the answer to this question would be no. And if that’s the case, then, logically speaking, you must hold the door open for the possibility of a strong, genetic correlation between race and traits such as aggressiveness and IQ. And from there, you’re only a hop, skip, and a jump away from Alt Right. I have a feeling however, based on your history, that you will never go there, regardless of logic and regardless of the evidence. This is why we call you a cuckservative. You exhibit greater loyalty to the cultural-Marxist Left than you do to real conservatives who are not afraid to call for a world which reflects our manifest racial differences. You carry water for people who despise you. Before all else, the Left professes one thing: Equality. Initially, this equality applied to the proletariat and the bourgeoisie. These days, however, it applies first and foremost to race. Despite being completely unproven and most likely false, Racial Equality is the talisman which gives the Left its power. It is its Commandment Number One: Thou Shall Not Deny Race Equality. After this, everything else is a mere corollary. Now, I know you don’t view yourself as a Leftist. You have spent decades battling the Left. I’ve read you. I know that you have. But your entire career so far amounts to little more than niggling over these corollaries. And you’ve been doing this almost entirely in the libertarian playground of the NRO where you and your peers play touch football and have constructed marvelous bulwarks against having to challenge the Left’s prevailing notions on race. If you’re not challenging the Left’s prevailing notions on race, then you’re not really challenging the Left at all. You’re allowing it to exist, which is tantamount to supporting it. What’s worse, you have the gall to defend the Left’s notions on race when it is attacked by the Alt Right, the people supposedly on your side of the aisle. This is why folks on the Alt Right question how conservative you really are. You see, to be conservative is to be anti-Left. You cannot have one without the other. In one of the articles I linked above, you referenced Russell Kirk. Well, perhaps you should brush up a little on The Conservative Mind. Does Kirk or any of the men he champions ever claim that all men are equal? In the eyes of God and in a court of law, yes. Other than that, most emphatically, no. I think you already know that being a conservative means in part accepting Mankind as it is as opposed to how we want it to be. Therefore, we must accept the inherent inequality among men. What I think you don’t know (or won’t publicly admit) is that this inequality exists not only within the races but between them as well. We have historical data supporting this, anthropological data, police data, psychometric data, anecdotal data, and a growing body of scientific and clinical data as well. Don’t you think it’s time to start taking the Alt Right seriously? Now, I understand why your hesitation goes beyond mere philosophical bone-picking. Having a racial or tribal attitude is distasteful to someone who has exerted tremendous effort in getting beyond race in order to unite humanity in its love for freedom, capitalism, and democracy. After all, conservative principles, as preached by National Review, benefit everyone regardless of race. I think free markets, limited government, open and fair elections, respect for tradition, piety in religion, and strength in our military are all good things and will benefit more people more often than any other form of government. Like I said, I understand. But have you not noticed that the only people really on board with all this post-racial epistemology have been whites? Only whites deny their own racial interests. Only whites beat themselves up over the sins of their ancestors. Only whites have made a real effort to accommodate other races by the millions. Only whites strive towards principled Liberalism. Have you ever seen blacks behave this way? Hispanics? Arabs? Asians? Anyone? You have not because it doesn’t happen in large enough numbers to be meaningful. Now, yes, you are honest enough to tut-tut non-whites whenever they abuse their race-card privileges. Thank you for that. But do you really think that Al Sharpton, Luis Gutierrez, or the folks at CAIR are going to change one iota because Jonah Goldberg or some other stuffed shirt at NRO outlines the seventeen and a half ways that they fall short of the colorblind ideals of Martin Luther King, Jr.? If you do, then please explain why your methods never bear fruit. National Review has been pointing out the inconsistencies and hypocrisies of the Left ever since I started reading it in the 1990s. How’s that been working out for ya? I’m going to say it and I’m going to say it slow: By tacitly accepting the Left’s notions on race, you are blind to the very likely possibility that most non-whites are incapabable of rising above race. That is, genetically incapable in the same way that most of us are genetically incapable of having perfect pitch or total recall. You seem to think that if they just read enough Milton Friedman (or at least Jay Nordlinger or Ramesh Ponnuru) they will change. They won’t. Of the people with the will to power, the vast majority who are black, Hispanic, Arab, and (to a lesser extent) Asian, view politics merely as a means to enrich themselves and their families and tribes. They are selfish and they are cynical. Whites can be like this too, but not quite as often, as evidenced by the wonderful countries we’ve built and maintained. Remember the oil-for-food scandal in the UN over a decade ago? I do. I remember how outraged National Review was at the time. I was outraged too. Billions were bilked, mostly by non-whites, starting with a close family member of Kofi Annan. This is normal behavior for these people. Put non-whites before a honeypot, and they will dip their paws in it. It doesn’t matter if the honey belongs to “the people.” This is one reason why people in countries led by non-whites are so poor. Their leaders rob them, oppress them, and show little concern as they suffer. One thing that the Alt Right understands that you don’t, Jonah, is that if we are going share political power with these people in equal measures — people who are racial and tribal by nature — then we will need to start adopting racial and tribal attitudes as well if we wish to survive. We have to put up our dukes with these people, and I am not talking about kid gloves. Back when Bill Buckley birched the Birchers in the early 1960s, America was over 90% white. We could afford to do that back then because non-whites held little political power, and the biggest threat to our society — communism — came mostly from abroad. Today, this is no longer the case. Non-whites flood our borders, burden our government with their needs, victimize our people with crime, and exert political influence which is increasingly anti-white, not to mention violent. And this says nothing of how Islamic refugees are currently transforming Western Europe. The biggest challenge white people face these days is not communism over there, but Third-Worldism over here, which, needless to say, is aided and abetted by your colleagues on the Left. Donald Trump is the only presidential candidate who comes close to understanding this, which is why he gets such enthusiastic support from the Alt Right and countless other whites who see their country slipping away from them. Sure, smarty-pants pundits like yourself can go to town on how many times Trump contradicts himself or expresses himself with less than perfect grammar. Sure, you can bemoan his lack of libertarian chops and his protectionist, populist tendencies. Sure, you can assault his character (“he is a glandular, generally friendless [by his own admission], zero-sum conniver who has made it clear that he sees nothing wrong with breaking promises — in business, in matrimony, and in politics — so long as he’s dubbed a ‘winner’ by a narcissistic standard of his own choosing.”). But this doesn’t change the fact that Donald Trump wants to take off those kid gloves when it comes to non-whites. That alone makes him worthy of the White House. Any mistakes he makes short of pressing the button can be corrected by later administrations in the same way Reagan corrected many of the dreadful mistakes of the Carter years. However, ceding our racial majority to the blacks and Hispanics cannot be corrected without tremendous bloodshed or else America will begin to resemble Mexico or Africa or worse. Once we reach that point, nothing will ever be the same again. Imagine politics as a vast hockey game with hundreds of players on each side. The conservatives have numbers and Truth on their side, and therefore should dominate. And with people like you leading us, we pride ourselves on our elegant play, fancy skating, and scrupulous adherence to the rules. However, the Left does little of this, and instead sics its enforcers on us whenever it can. These are toothless goons who think nothing of brutalizing our guys. Every time the Black Lives Matter crowd calls for the murder of cops, every time Muslims expect us to act on their ridiculous complaints, every time Hispanic congressmen lambaste “White America” in a speech, every time Facebook or Twitter bans race-realist whites while ignoring racist non-whites, we are seeing these Leftist enforcers in action. They are not playing by rules. They are going after white people because white people are white. Plain and simple. And remember, this is life. There are no referees. What makes Donald Trump so special is that he is the first serious presidential candidate to give time to our enforcers. That is, white, Right-wing enforcers. And trust me, Jonah, we are going to need them. You said yourself that Trump values winning and strength over liberty. This is true, but so what? What good is liberty if you don’t win? Now that whites are close to being a minority ourselves, we need to start giving as we have been getting. Or we could end up like our dear friend P. Caudatum. Your choice. Here lies the remains of American mainstream conservatism as championed by the great Jonah Goldberg. On his watch, we ceded the country to the Mexicans, the blacks, and the Muslims, which put our country forever in the crapper. But, oh, boy, was he consistent! When faced with a dire, existential threat as whites are today, intellectual consistency is little more than an academic’s way of planning to go to heaven when he dies. But for those of us who want to live, we need to start fighting. To paraphrase Nietzsche, sometimes you have to bathe in dirty water to keep your hands clean. The final point I wish to impress upon you is that you are not incorrect to characterize the Alt Right as anti-Semitic. This is your strongest argument for not supporting us, and it is one I admit I cannot overcome. Despite the anti-anti-Semitism of many of our more famous people (for example, Jared Taylor, Gavin McInnes, and John Derbyshire), I cannot and will not hide the fact that many on the Alt Right care little for Jews. Some are harpingly judeocritical, like myself. Others are outright anti-Semitic and call for the eventual and hopefully bloodless separation of Jews and white gentiles. And others, sadly, call for measures which we can euphemistically refer to as even less kind than that. So, I don’t expect a person of Jewish ancestry like yourself to be too excited when Donald Trump ushers in from the wilderness what basically amounts to the inheritors of the John Birch Society. Like I said before, I understand. However, I will ask you to please put yourself in the shoes of white gentiles today. We are slowly losing our countries. What’s happening in Western Europe will eventually happen here too. Our homelands are beginning to disappear in a chaotic sea of black and brown, and our code of morals, upheld for so long by Christianity, is being threatened by the cruel absolutism of Islam or the abject nihilism of the Left. In effect, we are experiencing the initial eddies of great civilization’s death spiral. Despite its checkered history with Jews, however, it is still great, as evidenced by how many Jews prefer to live in it rather than in Israel. So, do you really want to see it die? If not, you have to realize that your cleverly worded and logically sound syllogisms will do nothing to save it. The only way to save it is for whites in large numbers to adopt a racial and tribal perspective and to start fighting back. This means undoing much of the non-white immigration of the past 50 years. This means undoing most of the socialistic changes implemented in government during the same period. And this also means undoing many of the accomplishments of the Civil Rights Movement. Essentially, it means turning the clock back to 1960, before your former boss birched the Birchers. And if non-whites don’t like it and think they can do better in their own countries, they are welcome to go there. On the flip side, however, as adopting a racial attitude will necessarily bring people who don’t like non-whites into our camp, it will also necessarily bring in people who don’t like Jews. I am sorry you don’t like this, but for our side, it is a matter of principle. I am not asking you to join the Alt Right, Jonah. I am asking you not to dismiss us. I am asking you to recognize that we have more than just a dollop of justice on our side. I also want you to recognize that by hurling the cuckservative epithet at you, I am not trying to hurt you. I am simply trying to make you realize that you are doing the Left’s bidding by not challenging its spurious notions on race. I cannot predict the future, but I can say this: I know there are Jews and people of Jewish ancestry like yourself who truly respect and appreciate white gentiles. I am grateful for each and every one of you. If you are reasonable with us now, I am sure that when the time to part ways comes, we will be reasonable with you. Published: September 15, 2016 | This entry was posted in North American New Right and tagged articles, conservatives, Donald Trump, Jonah Goldberg, North American New Right, originals, Republicans, Spencer Quinn, the Alternative Right. Both comments and trackbacks are currently closed. Nicely put….a very civil (perhaps too much so) letter…. Technically Jonah Goldberg is not a cuckservative. He is doing what is in the best interests of his tribe. I would also chime in that Goldberg, as a Jew, is a different subspecies with different genetic interests. I like the letter but Jews correctly judge Europeans and all other competitors only by what utility they have for Jews. Morality, kindness, goodness, mercy and so forth is only for co-ethnics, not outsiders. Asking for understanding from a competitor who works overtime for the benefit of his tribe and the detriment of our tribe is futile and misses the big picture. 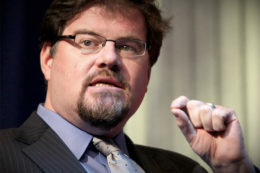 I agree with Matt Turner: Jonah Goldberg is a Jewish Supremacist, masquerading as a “white conservative.” He knows exactly the duplicity and disingenuousness of his arguments. Goldberg knows that advocating non-racial politics is the best way to destroy white civilization and advance Jewish interests under the naïve or willfully ignorant eyes. Enjoyed the article. Love the passion. I don’t buy the “he’s Jewish, so he can’t be a cuck” line of reasoning. While a very small percentage of Jews view themselves as White (in the proper, racial sense), plenty identify as white and take the same degree of perverted satisfaction from reveling in Person-of-non-color Guilt as that enjoyed by “cucked” non-Jewish Whites. (((Goldberg))) is a jew. He hates goyim. Enough said, really. But I’ll go ahead and add that being against or for Trump is not necessarily a jewish position. There are plenty of jews who do support Trump. Milo Yiannopoulos, Ezra Levant and Michael Savage are jews who are big time Trump supporters, just to name a few. Trump also has a lot of jewish friends and family who help him with his campaign. Trump is pro Israel and so is Hillary, so it shouldn’t be surprising that you have jews who support either candidate. Steven writes, “There are plenty of jews who do support Trump.” He is right. To take two examples, there are the brilliant Ilana Mercer and Trump’s superb speechwriter, Stephen Miller. According to Wikipedia Goldberg’s Mother wasn’t Jewish so he may be as much white Gentile is he is Jewish. If you think about it by being a proud Zionist he’s siding with the ethnic group that is permitted open identity in polite society rather than the one that isn’t. (((Jonah Goldberg))) is not White. Hence, he is not a Cuck. He knows exactly what he is doing and why. Shoulda used a different Conservative as your foil. This may not terribly much concern Mr. Goldberg, for it is not his people that will disappear. For Whites who value self-preservation, conversely, racially-minded politics is imperative. Jonah does not believe for one second in equality of the races. He thinks his own tribe is superior and he will do anything to anyone to keep that tribe enjoying its immense and unearned privilege. He was no loyalty to Whites, blacks, left or right – just his tribe. that tribe controls media, education, politics, television and is heavily invested in keeping it that way by guilting the living day lights out of Whites. They must be fearful of us, or jealous…Whatever it is I doubt it is open to reason. We are as if enchanted and we will die unless we wake up. Neocon Jews serve their tribal interests (under cover of “conservatism”). That means they’re aren’t cucks, by definition. Only traitorous gentiles can be cucks.